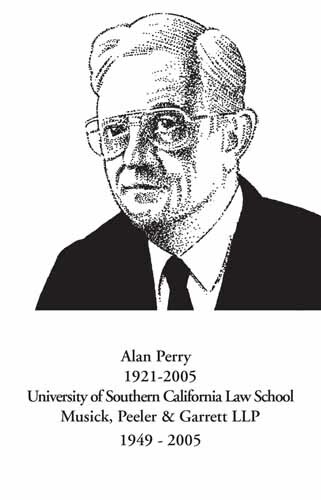 Alan R. Perry attended San Diego State College, Pomona College, and the University of Southern California Law School. At USC, he was assistant editor of the law review and was elected to Order of the Coif and Phi Beta Kappa. He received his LLB in 1949 and practiced law in San Diego for 56 years. Mr. Perry’s specialty was real estate and land use law. In 1950 he began his own firm, which in 1963 became Jenkins & Perry. In January 1990, Jenkins & Perry merged with the firm of Musick, Peeler & Garrett LLP, where Mr. Perry practiced until his death on August 18, 2005. Mr. Perry’s public service contributions included: director, assistant secretary and general counsel of the YMCA of San Diego County from 1980 to 2005; member and international general counsel of Lambda Alpha International, an international honorary land economics society; President of the Board of Trustees of the San Diego County Public Law Library's Law Library Justice Foundation from 1995 to 1998; adjunct professor of law at California Western School of Law from 1967 to 1983; and member and chairperson of the La Mesa Planning Commission from 1960 to 1970. Mr. Perry’s awards include: the San Diego County Law Library Justice Foundation’s Bernard E. Witkin, Esq. Award for civic leadership and excellence in the teaching and practice of the law in 2004; Lambda Alpha’s International Fellow award in 1995 and Crystal Globe award in 2000; San Diego County YMCA’s Golden Circle Award; induction into the San Diego County Building Industry Association’s Hall of Fame in 1995; and listing in the book "Best Lawyers in America" for 20 consecutive years. Mr. Perry’s publications include: "The General Plan of California," University of San Diego Law Review; "Inverse Condemnation," Pepperdine Law Review; two textbooks, "California Cases and Materials on Secured Land Financing" and "Introduction to Drafting California Legal Instruments", and his favorite, “San Diego’s Great Hispanic Heritage: The Pueblo Lands”.